Prime Minister explains at meeting of ministers why he sought to delay Greater Jerusalem Law, refers to French Law. 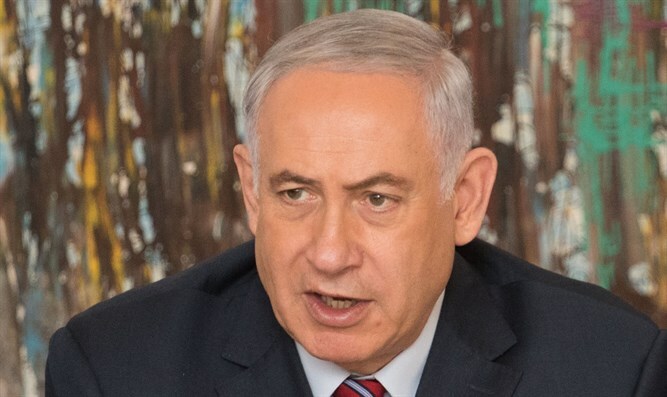 At a meeting of Likud ministers, Prime Minister Binyamin Netanyahu referred to the Greater Jerusalem Law, which he wished to delay. "We are in contact with the Americans all the time. The Americans turned to us seeking to understand the essence of the Law. As we have cooperated with them so far, it is worthwhile talking to them and coordinating with them. We are working to promote and develop settlement rather than promoting other goals," Netanyahu said. "With regard to the French Law, I say here clearly: I am not interested in any law relating to the investigations currently under way that are related to me or that are being conducted now and are not connected to me," he stated. Minister Yisrael Katz clarified this morning (Sunday) that the Greater Jerusalem Law will be brought to a vote today at the Ministerial Committee on Legislation, as agreed. "This is a historic law that will guarantee the Jewish majority in Jerusalem and strengthen our hold on the city." According to him, the law does not deal with political issues and its importance certainly exceeds any electoral political calculation of one sector or another. There is therefore no reason for it to be rejected. "I know of no other conflicting decision, and we intend to discuss the issue with the Prime Minister today. Ensuring the Jewish majority in Jerusalem is a historic task and we must all work together to achieve it." The bill includes municipal annexation to Jerusalem of communities around Jerusalem, such as Gush Etzion, Betar Illit, and Ma'aleh Adumim.